The hardest puzzle is figuring out why everyone has bunny ears. Ninja Usagimaru is a fun little eShop puzzler. I did enjoy my time with it, even though it was way too short. The game doesn’t try anything too ambitious but accomplishes what it sets out to do. While wandering through the forest, the games titular protagonist Usagimaru stumbles upon an empty village. A rabbit god informs the ninja that the residents have been kidnapped by evil Mononoke demons! 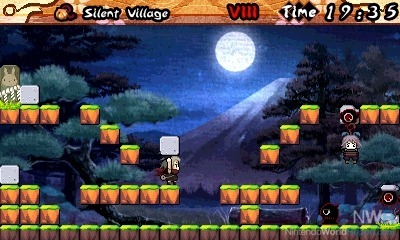 You must save the villagers in the most ninja way possible: by solving block puzzles. The puzzles themselves are pretty satisfying. Usagimaru needs to crush a certain enemy to free the villager, then lead the villager to the rabbit statue, so cutting off the path behind can be a death sentence. Only a few puzzles rely on platforming abilities, but expect to retry those levels quite a few times. Within the first of the game’s six non-tutorial worlds, you’ll gain half an item from each villager you save. It’s a simple way to ease into deeper mechanics, but these upgrades stop abruptly after the third one. The difficulty curve in this game is all over the place. If I found myself having to try the same level over and over, the next few levels would be simple and straightforward. I’m not sure if that was by design, but it kept me from getting discouraged. Solving a puzzle made me feel quite clever. At the start, each level looks like an impossible mess, but working my way toward the trapped villager mostly came naturally. Getting the villager to safety without killing her was a bit more difficult. She’s always just a split second behind you, so you’ll control your ninja with slightly different movements while escorting a villager. It’s a subtle difference, but it will kill you a few times. Seeing a room’s solution in front of me gave me the same sense of excitement as a Pushmo puzzle or a Zelda dungeon, but executing it was much trickier. It was always a bummer if I saw myself drop a block into a pit with no way to get it back up. I did wish for Pushmo’s time rewinding feature more than a few times, but the levels are short enough that a replay didn’t hurt much, unless I kept making the same mistake. Overall, the balance between difficult and straightforward puzzles was excellent. The story has a set up at the beginning, a single scene in the middle, and a closing at the end. I’m fine with how bare it is, but it was always a surprise when a story scene would show up. The art is good for what it is: the backgrounds are okay, the enemies are each distinct, and the characters are pretty darn adorable. The music builds a bit in each world and is full-blown ninja epic by the end. I did run into a few glitches that wouldn’t let me place blocks when I should be allowed to, but retrying usually fixed it. At only eight hours, Ninja Usagimaru is a fun little diversion during the annual summer drought. It did leave me wanting more, though. I’d happily pick up a sequel, but I wish this ninja outing would have lasted longer.